Following up on my promise, made in my post of 17 October 2008, to update you on the new Dean & Deluca Cafe, which recently opened in Dubai, I was lucky enough on my way back from Sudan (last post) to Vienna, to stopover in Dubai and as I didn’t want to let my readers down (what few they are), here’s my brief story of my visit. 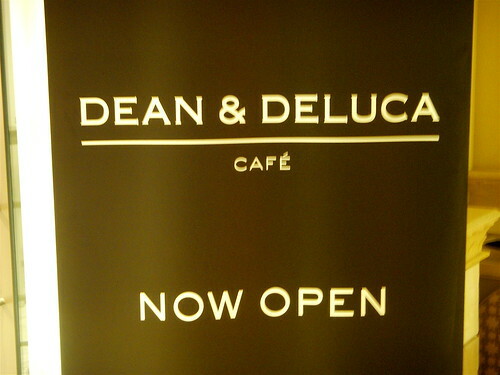 I don’t want to go into too much details, but Dean & Deluca are a famous New York Cafe/Deli, with international branches in Japan only, until the branch, situated at the Souk-al-Bahar, Old Town Commercial Island, Burj Dubai, opened in Dubai this year. The Souk-al-Bahar is designed internally to look like, wait for it, an old Arabian souk (i.e a group of street shops in English). It’s quite a new place, dotted with shops you will recognise and with expensive souvenirs with dark calm interiors. 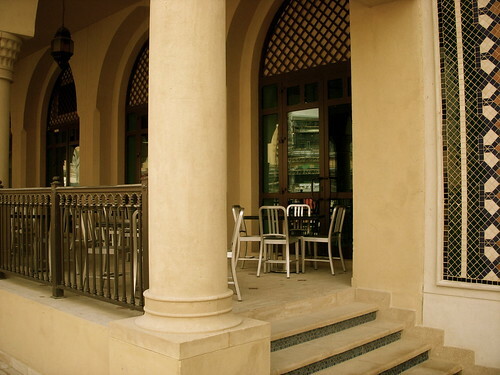 Dean & Deluca have got a really great spot in the Souk al-Bahar as it is one of a very few eating spots to have an outside balcony. Inside the shop is your typical black and white New York Deli interior and furniture. They’ve got a La Marzocco coffee machine and as it was still before 12pm, I decided to order a cappuccino. I ordered a regular, but was surprised by the rather biggish size of what I got, more for me I thought, unless they thought I was some kind of reviewer, but I wasn’t dressed as one. In any case, as usual I did my “Hey ! please tamp my coffee grounds properly before you place it into the porta-filter” routine and the barista kinda got the idea that I was serious about my coffee, even going as far to ask if I wanted milk with less fat in it for my frothed milk – of course I said no, as I only like the good full fat stuff. In any case, the coffee wasn’t bad, strongish enough to taste it with all that frothed milk. The counter is decorated with colourful fairy cakes and they also have a shelf of some tasty bits and pieces right in front of the barista counter. 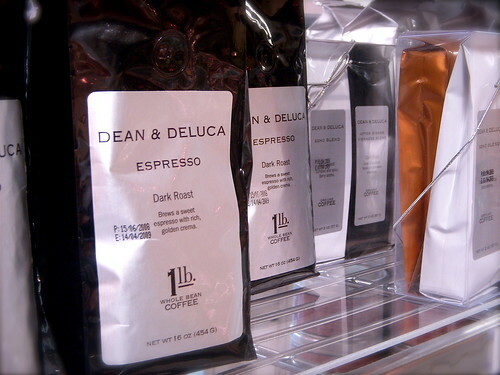 Of course they sell their own brand/roast of coffee, which make lovely gifts as they are nicely packaged, but as a bit of a fuss pot and seeing that they were roasted in mid-June 2008 and it was December 2008, I resisted temptation and just took a picture of the shelf. If you want to sit outside in the cooler months, which runs from about November to April, then their balcony sitting area is quite nice. 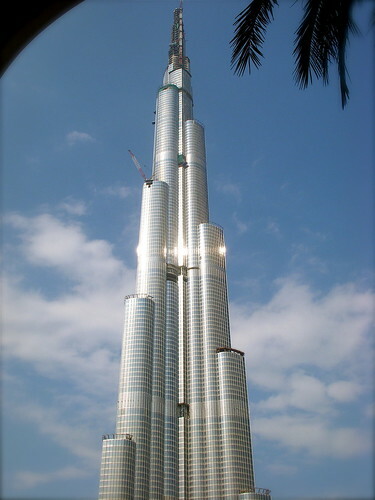 However, if that wasn’t enough and you are into a bit of sight seeing, then Dean & Deluca have the best spot to view the tallest building in the World, the Burj, which sits right in front of the balcony sitting area, Wow ! 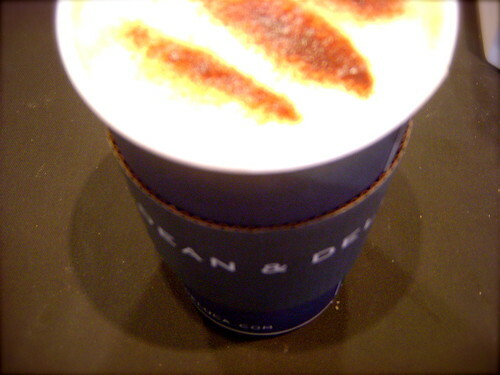 I recommend Dean & Deluca for a nice place to sit, eat breakfast and enjoy coffee – it is definitely on the list for my “drinking like an escapist” along the lines of “drinking African/South American coffee in a New York style deli in an Arabian dessert/sea resort in front of the tallest building in the World” Now Escape………and I think you get the picture of the place quite literally.